Assemble are a collective based in London who work across the fields of art, architecture and design. They began working together in 2010 and are comprised of 18 members. Assemble’s working practice seeks to address the typical disconnection between the public and the process by which places are made. Assemble champion a working practice that is interdependent and collaborative, seeking to to actively involve the public as both participant and collaborator in the ongoing realization of the work. 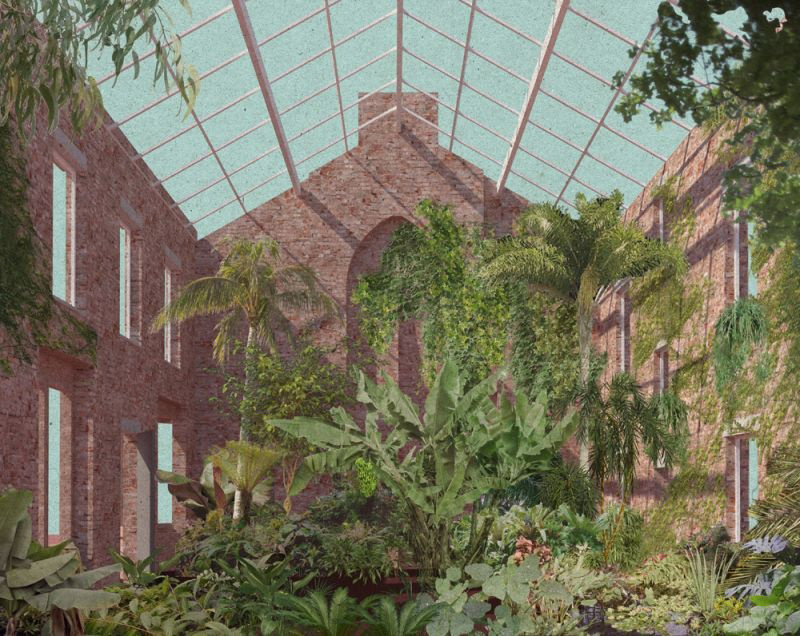 In 2015 Assemble were nominated for the Turner Prize for their collaborations with local residents in the Granby Four Streets, Liverpool. The Granby Four Streets are a cluster of terraced houses in Toxteth, Liverpool that were built around 1900 to house artisan workers. 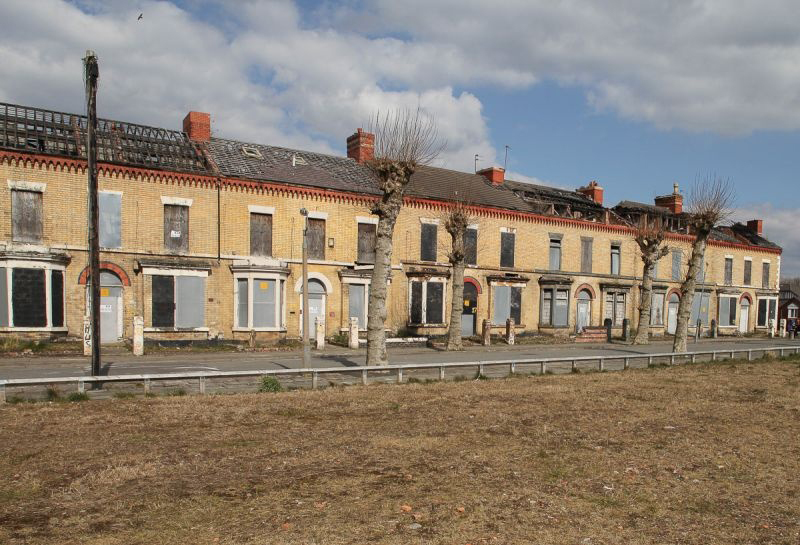 Following the Toxteth riots in 1981, the council acquired many of the houses in the area for demolition and redevelopment. Hundreds of people were moved out the area and houses subsequently fell into disrepair. Local residents consistently fought plans for demolition and battled to save the houses. Over the past 10 years they have cleaned and planted their streets, painted the empty houses, organized a thriving monthly market, founded a Community Land Trust and shown their area in a different light. Assemble worked with the Granby Four Streets CLT and Steinbeck Studios to present a sustainable and incremental vision for the area that builds on the hard work already done by local residents and translates it to the refurbishment of housing, public space and the provision of new work and enterprise opportunities. 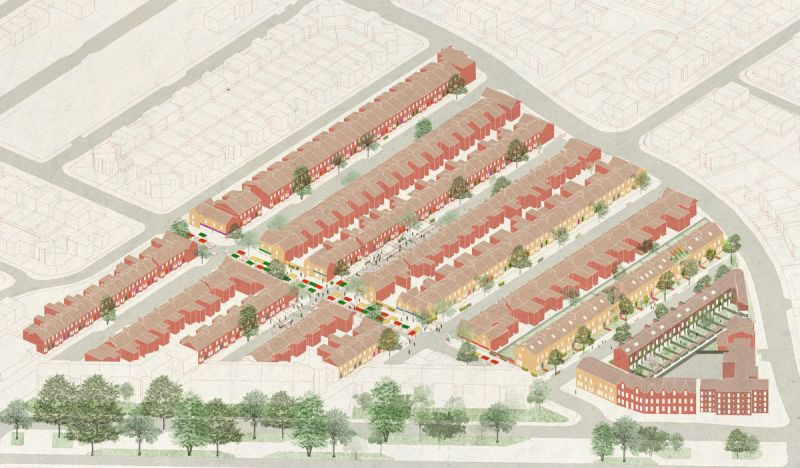 The approach is characterised by celebrating the value of the area’s architectural and cultural heritage, supporting public involvement and partnership working, offering local training and employment opportunities and nurturing the resourcefulness and DIY spirit that defines the four streets. 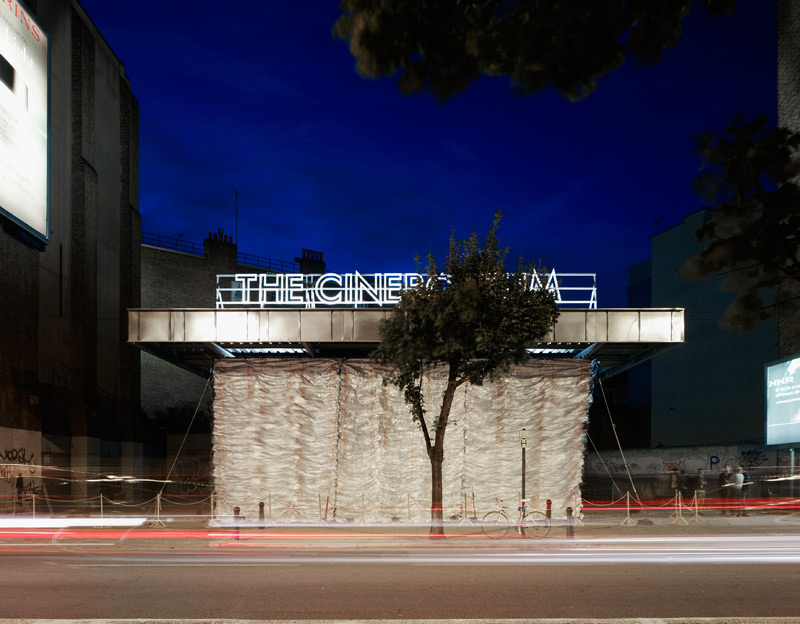 The Cineroleum was a self-initiated project that transformed a petrol station on Clerkenwell Road into a cinema. The project was an experiment in the the potential for the wider re-use of the UK’s 4,000 empty petrol stations. Classic elements were re-created for the roadside setting using cheap industrial, reclaimed or donated materials. 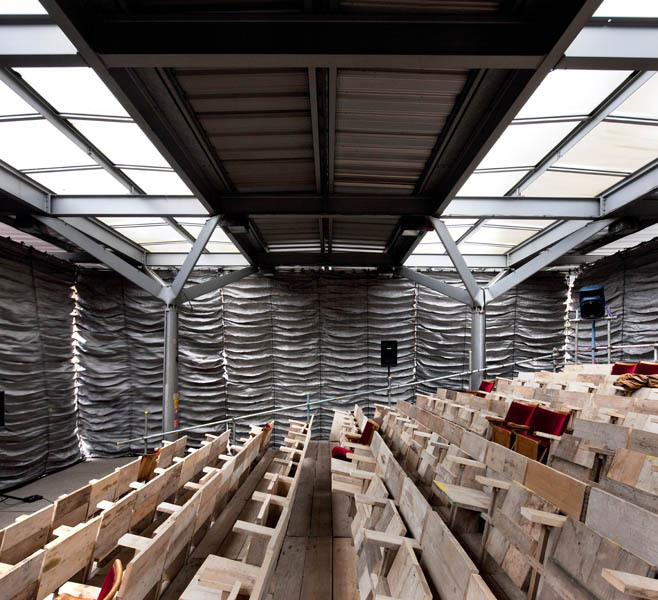 Flip-up seats were made from scaffolding boards, the foyer was furnished with formica-clad school chairs and tables, and the auditorium was enclosed by a curtain, created by hand-sewing about three kilometres of seam in roofing membrane. The Cineroleum was visibly handmade, built on site by a team of over a hundred volunteers, learning and experimenting together, aided by instruction manuals written during the prototyping process. Separated from the busiest single-lane road in Europe by a curtain, it allowed for both collective escapism and created a public spectacle on the street for passers-by. At the end of the film the curtain rose, pushing the audience from the imaginative world of the film to the everyday theatre of the street. 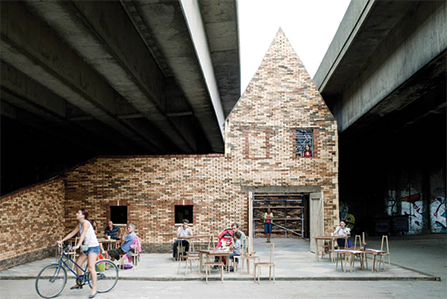 Folly for a Flyover transformed a disused motorway undercroft in Hackney Wick into an arts venue and new public space. Over nine weeks, 40,000 local residents, artists and visitors from across London came and performed, ate, watched and got involved with workshops, talks, walks and theatre. Starting with the idea that how spaces are imagined is often as important as their physical characteristics in determining their use, the Folly reclaimed the future of the site by re-imagining its past. The new ‘fairy tale’ for the site described the Folly as the home of a stubborn landlord who refused to move to make way for the motorway, which was subsequently built around him, leaving him with his pitched roof stuck between the East and Westbound lanes. The Folly was designed as giant construction kit, which allowed volunteers of any skill or commitment level to get involved in building it. The walls of the Folly were an inter-woven bead curtain. At the end of the summer, they were unstrung and used to make new play and planting facilities for a local primary school. The success of the project persuaded the London Legacy Development Corporation to invest in permanent infrastructure which has allowed the site to continue as a public space.